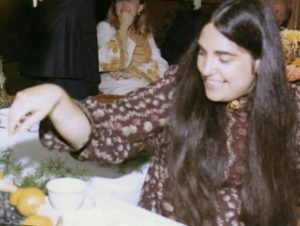 Margot Susanna Adler (April 16, 1946 – July 28, 2014) was an American author, journalist, lecturer, Wiccan priestess. I was fortunate to meet Margot on several occasions in England, the Netherlands and in America. 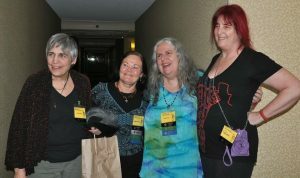 The last meeting was at PantheaCon, San Jose, in February 2014. Although we knew that Margot was suffering from cancer – we even did some healing work for her at PantheaCon – she never complained. So when she passed away in July 2014 it still came as a shock. 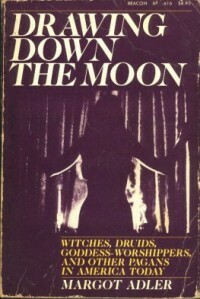 My first recollection of Margot was as author of the book Drawing down the Moon, first published in 1979, Viking Press. This was coincidentally the year I was initiated. I remember reading the book and going “Wow, wow, wow!” It underwent several revisions as new groups were added. TWPT: Did you have any idea that your book would be so popular that it would be on most recommended reading lists for those who were considering the Wiccan/Pagan paths? How does that make you feel knowing that you are for many seekers the introduction to these brand new worlds of spirituality? Margot: The book’s real popularity didn’t happen for the first few years. Viking only published five thousand copies, and Beacon bought the paperback rights for about $4000 dollars, and put out a paperback edition with a very unexciting cover with Janet Farrar on it. Then in 1986, the revised edition really took off, and that edition with the fabulous red and black cover and the big resource section was when I think it made a deep impact. I know I didn’t get a single penny of royalties until after the revised edition came out. I think the fact that this book is read in small town libraries, in prisons, etc. is one of my favorite things about it. It is still the way many people come to understand Paganism. It is often the book people give their parents or someone else who they think will be very skittish learning about the Craft. I think on a very deep psychological level, I did write the book to be one that my atheist father could be proud of, and he was. He could always defend it intellectually, even though he hated all that “religion stuff”. Looking back, I might have written more personally if I had written at a later point in my life. But other than that, I’m still very proud of it, and of the time and care I took with every footnote. 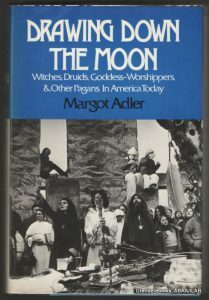 When I first started out in Wicca, one of the first two books I read was Drawing Down the Moon by Margot Adler, and much later I knew of her being on National Public Radio. We come to categorize people and put them in boxes, but if we really look a bit at them we find that we know very little. In beginning to research Margot, I found there was a lot I didn’t know about her and was in a quandary over how to interview her. But she gave her permission and then all I had to do was find the right questions to ask. Christopher: Your life seems to be a major order of self-discovery. I was struck by something you said when you were studying Greek goddesses in 1957. You said you decided you didn’t want to worship them, you wanted to be them. Have you always been driven to be a doer in life? during the 1960s I spent a lot of time in activism, so I suppose that was “doing”, but I have never thought of myself as a “doer”, it was a new thought for me, when you asked it. 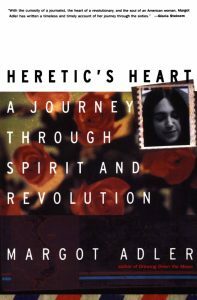 Christopher: You have recently had a book published, Heretic’s Heart: A Journey Spirit and Revolution. I think there were about as many experiences of the 60s as there were people. What were the 60s to you? Margot: What were the sixties to me? It was a time when everything was on the table. Nothing had hardened into concrete. So, one was free to imagine society and one D5s own life as malleable. There were infinite ways to create society, to create communities, to love, to share, etc. One could re-imagine how work should be, what kind of relationships people could be in. In other words, many of the alternate worlds that science fiction writers imagine, we could imagine as possible in the here and now. That is why there were attempts at communes, at group love, at anarchist forms of community. Some of these experiments were silly, even stupid. But the fact was, everything was open and that was incredibly exciting C9 it was a world filled with ecstasy and possibility. Christopher: What were the movements that grabbed your attention? Margot: Primarily the civil rights movement first, then the anti-war movement, and probably I would have to admit I was fascinated by and looked at with yearning, but did not really participate in, the more intense revolutionary movements that were all around me. Christopher: In 1968, you were just getting into radio. Why radio and why have you have stuck with it? Think about it, in radio, like books, you make the pictures, it is the medium of ideas, dreams and the imagination, and you can create real community, and we at WBAI did that. Christopher: You started with National Public Radio in 1979. Why NPR, what made it the place to be for your career? Margot: Again, pure fluke. A bunch of us were thrown off Pacifica, after some very weird decisions were made, and we took over the station, occupied the building, etc., had our FCC licenses suspended. It was the end of an era. A year later, after living on a tiny bit of unemployment, getting a little help from my boyfriend, later to be my husband, and writing Drawing Down the Moon, I went down one day to help the old station fundraise. I sat next to an old colleague who was a producer at NPR and later we went out for a beer. He asked me to come and freelance C9 which I did. I ended up getting hired a year later. It has never had the depth and the community for me of those old radio shows, but it is a place that still, after 30 years, allows me and many others to do real, creative work and talk about real issues. Christopher: You are a serious journalist. You have done many special broadcasts. Which were some of the ones that you are the proudest of? What do you look for in a story? Margot: I like to turn the world upside down. I like to do stories which sort of say, ha, you thought that, but it is really complex and often exactly the opposite. Stories I am proud of. Here are three. One of the first stories on Aids counsellors in San Francisco in the early 80s. Another was a story on adoption of the disabled that actually had an effect on changing the law, making adoption of disabled children easier. And I was the American who discovered J.K Rowling for the media here in the States who did the first radio interview and there is a book out that says my stories had an impact on the phenomenon. Who knows if it is true? Christopher: National Public Radio has been under political attack for many years by the political conservatives. Yet it is still with us. What has kept it going when so much else has gone under? Margot: Radio creates community; you know the phrase, “driveway moments”. It is also not as liberal as all that. It is way more conservative than I am, and I think it has become more so. And I am not nearly as radical as I was, so everything has moved to the right. It’s just that there was so much of a move to the right by the country that NPR moved less to the right than everything else C9 but NPR endures because the people on it make real connections to people out there they are people you know and can trust. And again, radio is the medium of dreams, ideas and the imagination. Christopher: As I mentioned, Drawing Down the Moon was one of the first books I read. How did it come to be and how did you learn as much as you did Pagan communities? Wasn’t it the first attempt to study the new movement? Margot: Yes, the first attempt to really study it seriously; there had been other books, but they were more pop. I was involved in Wicca, had been since the fall of ’71, and was in a group, starting in the winter of ’72. And I would get these two magazines, Nemeton and the Green Egg, and the discussions in those magazines were so much deeper than what I was experiencing in my little group. So, I was really determined to find out where this deeper Pagan reality was. Again, fluke, I met an agent introduced to me by a boyfriend, and I had never thought of a book. When I told her about Wicca and the Pagan movement she suggested I write a book. Through a series of very lucky circumstances, she had just left an agency and was actually looking for clients. So, she showed me how to write a proposal, and it went around and got rejected and almost accepted, and rejected, etc, until it got accepted by Viking press and I got half of a $7500 advance to do it. So, then I sat in the library for six months and read all the books I felt I should read before writing, and then I wrote all the interesting people in Green Egg and asked to meet them and used the money to travel around the country. That’s how it happened. Christopher: You are well known in our community as an author, lecturer, and as one who gives workshops on various subjects. How does your religion affect your life in general? How long have you been open about your religion? sacred. I do my personal rituals as well. I am living too much of a mundane life at the moment, and hope, once my son goes to college, to have a bit more time for my spiritual life. Christopher: As I said you are a doer. You are not one to sit on the side-lines in anything you think important. Any advice for our readers on how they might find out what they can take part in and what they have to offer? Margot: The real difference now from when I started is the internet. Witchvox.com has many articles and you can read up on some 70 pagans traditions there. There are open Pagan circles in many communities. If they live in a very conservative community, often the Unitarian Universalist church is a good doorway to meet people involved in earth spirituality. Christopher: Where can people learn more about you, your books, beliefs and ideas? Margot: I have a fan page on Facebook where you can click on a dozen columns I wrote for Beliefnet. Or you can go to Beliefnet and read them. You can hear all my mundane pieces on npr.org; just put in my name or the subject, such as Harry Potter. My books: Drawing Down the Moon and Heretic’s Heart are available in all the obvious places like Amazon and you can order them from your local bookstore. 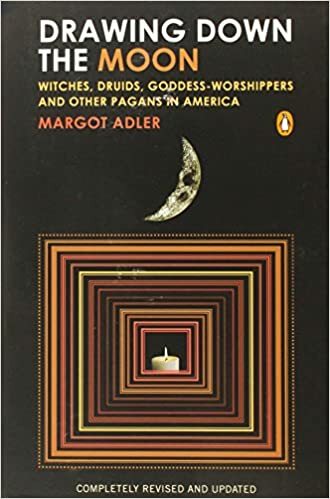 Margot: Just remember, if you go far enough back, all our relatives were Pagans – that is, they were part of religions based on seasonal ceremonies, rituals of doing as opposed to believing. The Pagan project, so to speak, is an attempt to create a new/old revived recreated religion that combines ritual and ecstasy with intellectual integrity. It doesn’t take itself literally, has no literal scripture and is therefore at home with change, with modern science and more. It doesn’t proselytize, but if it’s what you always believed, you will find it.